Wouldn't it be nice to have a pen and paper in your wallet? It would be an easy way to capture ideas wherever you are—in a restaurant, on the bus, in the kitchen—wherever. You can buy this sort of thing, but the price is steep. The David Allen NoteTaker Wallet will set you back $89, while the Levenger International Pocket Briefcase is $58 (or $86 with pen). 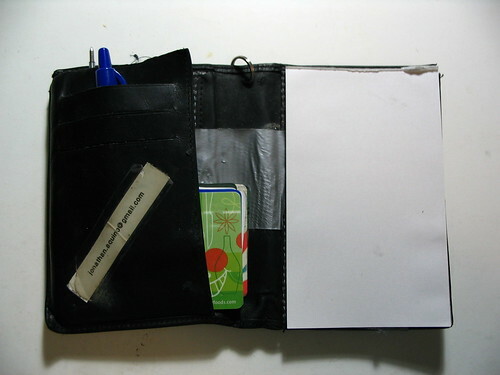 Affix the pad of paper to your wallet using a few pieces of rolled-up duct tape. Then stick the pen in one of the wallet pockets. You will then have a perfectly good note-taker wallet. Pull it out when an idea strikes you, in grocery lineups, while walking, etc. Advanced technique: When you need a pen (but not paper), disengage the pen from the wallet while leaving the wallet in your pocket. Now put it back. For pens, you have a number of good choices, depending on how much you want to spend. If you've got cash to burn, the $20 Fisher Bullet Space Pen has a loyal following, but I think the $33 Lamy Pico is cooler (video). 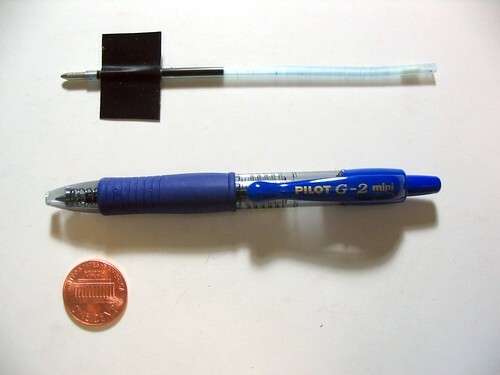 On the cheap, you can make your own "winged" PicoPad-style pen from a ballpoint ink tube and a piece of tape (see below). Or you can just head to an art store and buy a small pen for $3 (like the Pilot G-2 Mini shown below). There—I saved you 89 bucks. posted by Jonathan at 11/21/2009 08:13:00 p.m.